This clings to the inside of your vehicle window. This static cling is approximately 18 x 8,3 cm and also includes a copy tag that you can write down the code on and keep for your records. 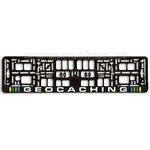 Trackable at geocaching.com with travelbug icon.